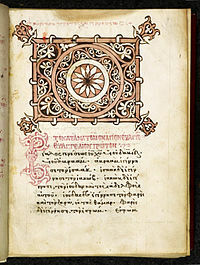 ↑ Eusebius, "History of the Church" 3.39.14-17, c. 325 CE, Greek text 16: "ταῦτα μὲν οὖν ἱστόρηται τῷ Παπίᾳ περὶ τοῦ Μάρκου• περὶ δὲ τοῦ Ματθαῖου ταῦτ’ εἴρηται• Ματθαῖος μὲν οὖν Ἑβραΐδι διαλέκτῳ τὰ λόγια συνετάξατο, ἡρμήνευσεν δ’ αὐτὰ ὡς ἧν δυνατὸς ἕκαστος. Various English translations published, standard reference translation by Philip Schaff at CCEL: "[C]oncerning Matthew he [Papias] writes as follows: 'So then(963) Matthew wrote the oracles in the Hebrew language, and every one interpreted them as he was able. '(964)" Online version includes footnotes 963 and 964 by Schaff. ↑ This view is based on three arguments: (a) the setting reflects the final separation of Church and Synagogue, about 85 CE; (b) it reflects the capture of Rome and destruction of the Temple by the Romans in 70 CE; (c) it uses Mark, usually dated around 70 CE, as a source. (See R.T France (2007), "The Gospel of Matthew", p. 18.) France himself is not convinced by the majority – see his Commentary, pages 18-19. ↑ France, p. 26 note 1, and p. 28: "The first two words of Matthew's gospel are literally “book of genesis”. ↑ Daniel B. Wallace (ed.) 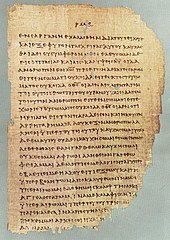 Revisiting the Corruption of the New Testament: Manuscript, Patristic, and Apocryphal Evidence, Kregel Academic, 2011, passim. ↑ Mark D. Roberts, Investigating the Reliability of Matthew, Crossway Publisher, 2007, p58. ↑ John Wenham, Redating Matthew, Mark, and Luke, (London: Hodder and Stoughton, 1991) p116.